Life is made of stories. 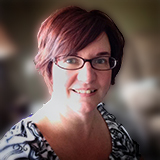 Posted in 52 Ancestors Challenge on June 30, 2015 by Amy Johnson Crow. Week 27 (July 2-8) – Independent: This is the week for Independence Day! Which one fought for (or against) America’s independence? Or which of your ancestors was independent? 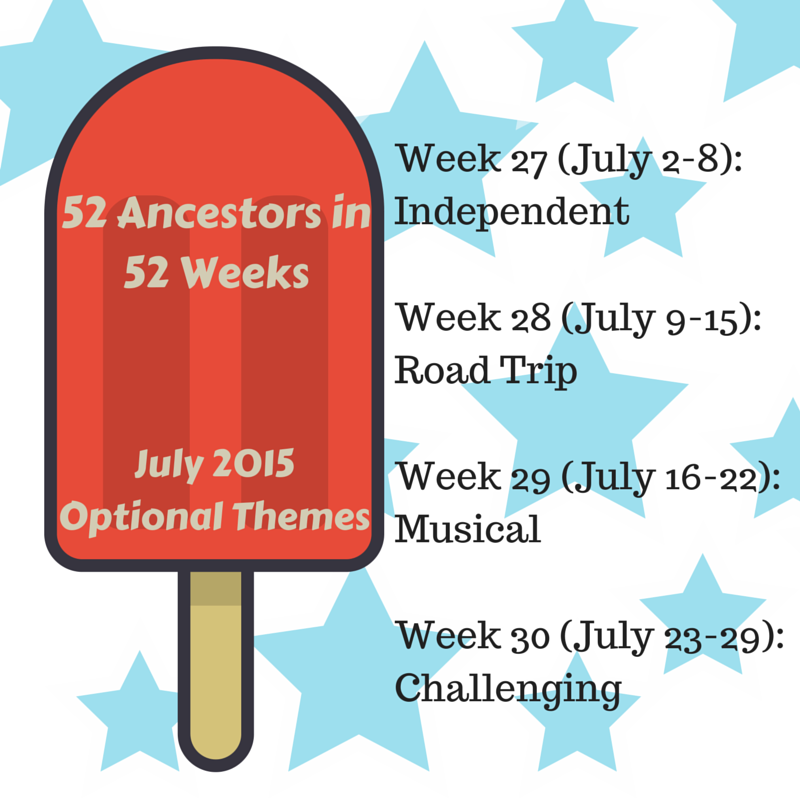 Week 28 (July 9-15) – Road Trip: Any epic “road trips” in your family tree? Which ancestor do you want to take a road trip to go research? Week 29 (July 16-22) – Musical: There seems to be a musician in every family. Who is the one in yours? Don’t have a musician? Which ancestor has a lyrical name or reminds you of a song? Week 30 (July 23-29) – Challenging: It’s a good time to take a look at another challenging-to-research ancestor. The weekly recaps will be posted on Thursdays. I look forward to seeing your posts! My grandmother left a lasting legacy to her grandchildren, sterling advice to always put family, first. I love this!!! I may be joining y’all halfway through this thing. Looks like too much fun not to. Here is a post about my 7th Great Grandfather who was alive during the Revolutionary war. I’ve been wondering what this 52 Ancestor in 52 weeks thing is. Is it a writing prompt and can anyone join? 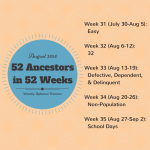 52 Ancestors in 52 Weeks is a challenge to write about one ancestor per week each week for a year. We didn’t do any prompts in 2014, but added optional writing prompts this year. Each Thursday (sometimes Friday 😉 ) I post a weekly recap where people can leave a comment with a link to the post they did that week. It’s a good opportunity to find others researching your ancestor. This page has links to all of the optional weekly themes. Again, you don’t have to use the optional theme; they’re there to help spark ideas on who to write about. Join in the fun! Thanks! It does sound like fun. I'm Amy Johnson Crow. Welcome to No Story Too Small! Have new posts sent right to your inbox!